Ann Kearney found her artistic home when she was first introduced to metalsmithing during her college years. As a transfer to New York State University at New Paltz, for her nationally recognized metals, she graduated with a Bachelor of Fine Arts in Gold and Silversmithing. With a degree in hand, she moved to Albany, New York, where she started a handcrafted jewelry business and continued with successfully over the next decade. Soon after, she became the sole designer for a jewelry manufacturing company, but her craftsman’s heart became restless and she returned to her own business in 2002. Today, she lives and works in the small town of Cambridge, New York. The original Cambridge Post Office is where she operates Ten Gallery and has her studio work space. In true enjoyment of her work with precious metals and stones, Kearney incorporates elegant elemental forms into functional and feminine jewelry. 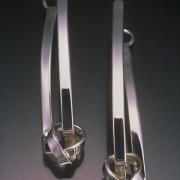 All of her pieces are handmade in her studio using the finest workmanship and the highest quality materials. Her hope is that women delight in wearing the pieces she makes as much as she delights in making them.